This work is from the 'Recording Britain' collection of topographical watercolours and drawings made in the early 1940s during the Second World War. In 1940 the Committee for the Employment of Artists in Wartime, part of the Ministry of Labour and National Service, launched a scheme to employ artists to record the home front in Britain, funded by a grant from the Pilgrim Trust. 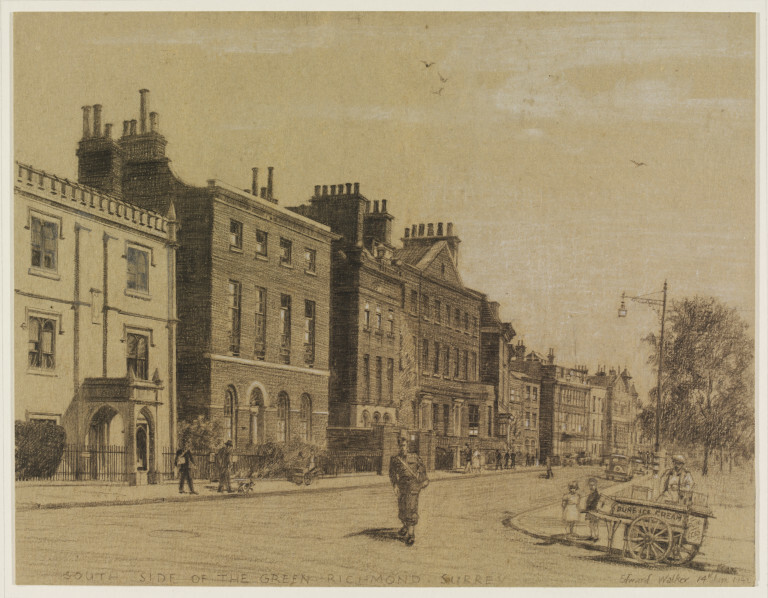 It ran until 1943 and some of the country's finest watercolour painters, such as John Piper, Sir William Russell Flint and Rowland Hilder, were commissioned to make paintings and drawings of buildings, scenes, and places which captured a sense of national identity. Their subjects were typically English: market towns and villages, churches and country estates, rural landscapes and industries, rivers and wild places, monuments and ruins. Northern Ireland was not covered, only four Welsh counties were included, and a separate scheme ran in Scotland. The scheme was known as 'Recording the changing face of Britain' and was established by Sir Kenneth Clark, then the director of the National Gallery. It ran alongside the official War Artists' Scheme, which he also initiated. Clark was inspired by several motives: at the outbreak of war in 1939, there was a concern to document the British landscape in the face of the imminent threat of bomb damage, invasion, and loss caused by the operations of war. This was allied to an anxiety about changes to the landscape already underway, such as the rapid growth of cities, road building and housing developments, the decline of rural ways of life and industries, and new agricultural practices, which together contributed to the idea of a 'vanishing Britain'. Clark also wanted to help artists, and the traditional forms of British art such as watercolour painting, to survive during the uncertain conditions of wartime. He in turn was inspired by America's Federal Arts Project which was designed to give artists employment during the Great Depression of the 1930s. Over 1500 works were eventually produced by 97 artists, of whom 63 were specially commissioned. At the time the collection had a propaganda role, intended to boost national morale by celebrating Britain's landscapes and heritage. 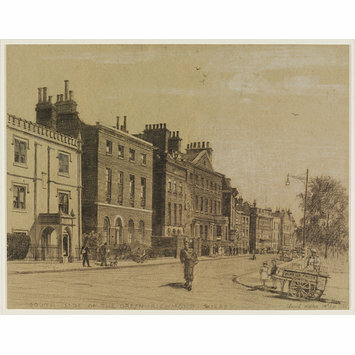 Three exhibitions were held during the war at the National Gallery, and pictures from the collection were sent on touring exhibitions and to galleries all around the country. After the war, the whole collection was given to the V&A by the Pilgrim Trust in 1949, and it was documented in a four volume catalogue published between 1946 and 1949. For many years the majority of the collection was on loan to councils and record offices in each county, until recalled by the V&A around 1990. The pictures now form a memorial to the war effort, and a unique record of their time. South Side of the Green, Richmond (Recording Britain, Surrey). Catalogue of Drawings in the ‘Recording Britain’ Collection given by the Pilgrim Trust to the Victoria and Albert Museum published by the Victoria and Albert Museum, Prints, Drawings and Paintings Department, 1951. Palmer, Arnold, ed. Recording Britain. London: Oxford University Press, 1946-49. Vol 1: London and Middlesex, Surrey, Berkshire, Buckinghamshire, Hertfordshire, Bedfordshire. Introduction to Surrey, p.75.